Cooper Wiring Devices manufacturers the Arrowhart line of locking devices, pin and sleeve devices, plugs, connectors, and receptacles, as well as motor controls and weatherproof covers and boxes for use in commercial, industrial, and Institutional Applications. They also offer an unmatched spectrum of innovative products including Aspire RF™ controllers, dimmers and switches, Aspire™ smart dimmers, switches, fan controls, and GFCI, and MediaSync™ home networking, controls, and power protection. 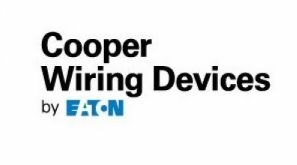 Cooper Wiring Devices is part of the electrical business of Eaton. Eaton acquired Cooper Industries plc in late 2012. With the addition of Cooper Wiring Devices’ broad portfolio of innovative electrical connectivity and control solutions, Eaton now offers commercial, industrial and residential construction markets the solutions needed to keep power accessible, reliable and safe. Eaton’s wiring devices business brings a whole new level of connectivity to your facility, job site and home.